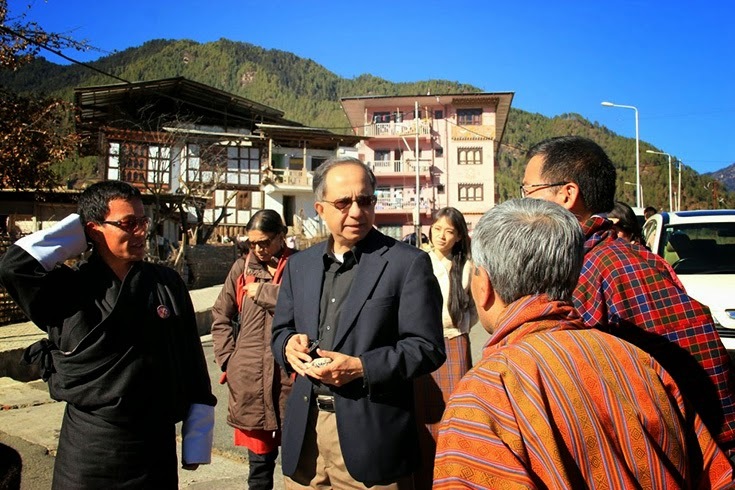 Thimphu, Bhutan: The World Bank Group’s Senior Vice President and Chief Economist, Kaushik Basu, visited Bhutan to learn from the country’s unique development experience and highlight opportunities as the country continues to make rapid progress in reducing poverty and boosting shared prosperity. During his visit, Basu had an audience with His Majesty, Jigme Khesar Namgyel Wangchuck. He also met with Prime Minister Tshering Tobgay, Minister of Finance Lyonpo Namgay Dorji, and Deputy Governor of the Royal Monetary Authority, Pushpalal Chhetri. Additionally, Basu discussed some concepts behind Gross National Happiness with the head of the Center of Bhutanese Studies, Dasho Karma Ura, and highlighted findings from the latest World Development Report on Mind, Society, and Behavior to a range of policy makers. He also visited World Bank supported urban development projects and encouraged students from across South Asia at the 11th South Asia Economics’ Students Meet to be catalysts for greater regional cooperation and global peace. Basu visits Bhutan as the country continues to progress in reducing poverty and achieving development goals driven through increasing agricultural commercialization, expansion of rural roads, and revenues from hydroelectric investments. The World Bank strategy in Bhutan focuses on improving rural livelihoods and managing urbanization while protecting its natural assets. It has currently committed $82 million in concessional development credits, a number of technical assistance grants and analytical work for these areas to improve fiscal and spending efficiency, fostering private sector growth and competitiveness, and supporting green development.